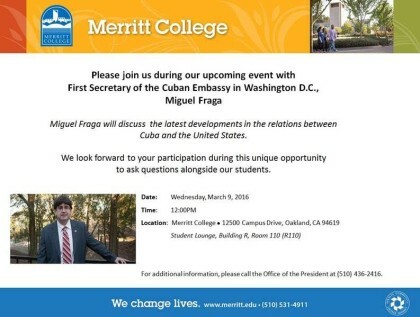 The first secretary of the newly reestablished Cuban Embassy in Washington D.C., Miguel Fraga, will hold an important conversation with the Merritt College community on Wednesday, March 9, at noon in the Student Lounge (R Building, Room 110). The First Secretary’s talk is entitled, “Has U.S. Policy Really Changed,” and is free and open to the public. For more information, please call the Office of the President at (510) 436-2416.